Learn what Special Coverage Pages are and how to create them! 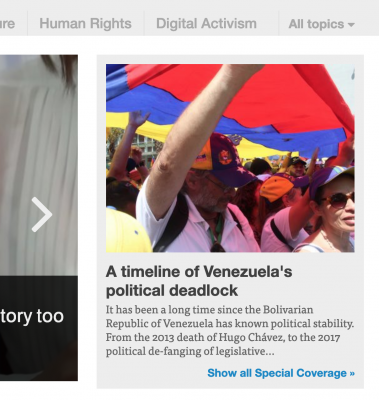 On Global Voices, Special Coverage Pages (SCP) are a tool we use to take big, important and ongoing stories, and summarize them for someone new to the issue. We usually create SCP when we already have several articles about the story in question, and use the SCP as a place to link to each of our stories along with summaries and context that makes them easier to understand. For a reader, going through a full SCP could be a way to really understand the story as it developed over time, or they might just skim the SCP as a way to “catch up” on the story before reading the most recent update on the issue being discussed. It's vital that you set the page Parent to be the Special Coverage index page. Before beginning the technical creation of an SCP, confirm with the managing editor(s) that the topic is appropriate, and plan out the actual content of the page. 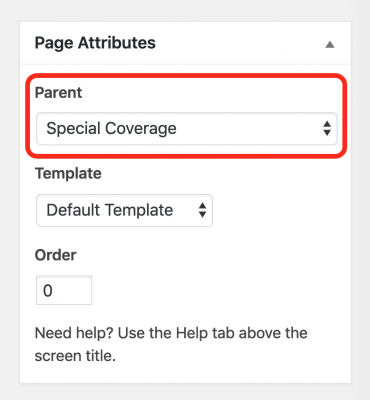 In the Page Attributes box's pulldown menu for Parent, set the parent page to Special Coverage (the Special Coverage index page). Fill out the page content itself, with links to articles about the subject, images and summaries etc. As with any article, ensure the Featured Image is set along with other post metadata, then publish. Please note that as with all “pages” in our WordPress system, most users are unable to edit them by default. Users with the Editor role are able to create and edit their own pages, but by default aren't able to edit pages where a different user is the author (thus most pages are un-editable). There is an easy way around this, Edit Flow's Notifications box! Here are the ways you can have access to edit a page. So if you need to edit a page, but don't have access, ask a managing editor to edit the page and subscribe you in the notifications box. At that point you should be able to interact as normal. Special Coverage Page showing on the homepage of GV. This is whichever SCP was most recently edited. By default in the GV theme (used by all Lingua sites including English) the most recently edited SCP will be displayed at the top of the homepage, next to the featured posts. The featured image and title will show, along with a link to “Show all Special Coverage” that links to the Special Coverage Pages index page. The page shown in this space is always whichever was most recently edited. To change the page showing, simply edit the page you want to show, and save the page without changes. This system is pretty arbitrary, but very fast and easy to use compared to other options. It also has the benefit of automatically updating the homepage when new URLs are added to an existing page. The managing editor is responsible for keeping an eye on the page being shown and updating it if necessary.